Dr. Clara Ramírez Barat, Director of AIPR’s Educational Policies Program, travelled to El Salvador to conduct follow-up consultation meetings related to the activities of the Educación, Derechos Humanos y Prevención (Education, Human Rights and Prevention) Project on March 15-16, 2017. 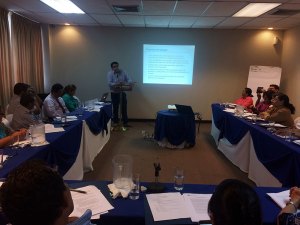 The project, which began with an initial consultation in July of 2016 in San Salvador, is being carried by the Auschwitz Institute in collaboration with the Salvadoran Procuraduria para la Defensa de los Derechos Humanos (Ombudsman’s Office of El Salvador – PDDH), under the framework of the activities developed within the Latin American Network for Genocide and Mass Atrocity Prevention. Dr. Ramírez Barat participated in two primary meetings related to the project. The first took place on March 15 in conjunction with the Salvadoran Ministry of Education and consisted of a half-day meeting with approximately 30 educators, including members of the Network of Specialists in the Social Sciences from the city of San Salvador and different members of the Ministry of Education including the National Director of Primary Education, Xiomara Rodríguez. The meeting was divided into two parts. The first half featured a presentation by Dr. Ramírez Barat on transitional justice and education, while the second half consisted of a session in which AIPR and the Salvadoran Office of the Ombudsman discussed the state of the Education, Human Rights, and Prevention Project, as it is developing in El Salvador. The second session allowed for AIPR and the PDDH to gather the impressions of attending teachers on the work being done as well as ideas for ways that the project can better incorporate their concerns and inputs from the beginning. More information (in Spanish) on the meeting can be found on the website of the Salvadoran Ministry of Education by clicking here. On March 16, Dr. Ramírez Barat conducted a second half-day meeting with the original working group of the Project on Education, Human Rights and Prevention. This group consisted of 35 representatives from the education community, academia, civil society, and various public institutions in El Salvador, as well as several observers from international organizations convened to discuss and establish the initial parameters of a work proposal that would be developed by a group of subject matter experts. After the discussing the proposal that had been successfully developed by the Auschwitz Institute and the PDHH since the initial meeting, the group agreed on the next steps for the project, including an implementation plan to guide the project forward. For example, AIPR and the PDDH are now working to include the direct involvement of the Salvadoran Ministry of Education in the project. The meeting served as a very useful platform for the exchange of ideas and highlighted the lessons learned from the project thus far, which can be applied to efforts in other parts of Latin America as well as elsewhere in the world. After several months working in the project, for AIPR is extremely reassuring to see the sustained interest and involvement from different actors in Salvadoran society. We are trying to build a project that, from the start, which really addresses the needs and challenges related to education when it comes to building preventive programs. For us, being able to include as many voices as possible in this process is essential to ensuring the relevance, legitimacy, and longer-term usefulness the project. The Education Project, as provided for by the framework developed through the Latin American Network for Genocide and Mass Atrocity Prevention, continues to develop in Brazil as well. In similar fashion to those carried out in El Salvador, a second round of meetings will take place in Sao Paulo in April of 2017, in collaboration with the PFDC and the SEDH.